Filed to: creepin?Filed to: creepin? Ohio State and Alabama played a legendary New Year's Day game, in which OSU trounced Alabama in a 42-35 upset, carrying the Buckeyes to the championships or whatever. That's terrific news for OSU fans—except, perhaps, this woman, whose presence was caught on television and who may have just been caught creepin' on national television. Sugar Bowl, indeed! 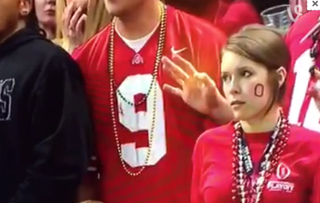 DJ Sourmilk's caption for this Vine is, "When you're at the game with your side dude and realize you're on TV." Homegirl is from Ohio and is absolutely not supposed to be in New Orleans. She called out "sick" to work back in Columbus and now her tyrannical boss at the Mandee's is totally gonna chew her out. Homegirl is super soused. That's her boyfriend on the other side of her. She is rubbing the neck of a stranger. Homegirl is the lost Mara, the one "we don't talk about," and now the world is going to know that Kate and Rooney's sister is trying to live her life as a normal college student, and not the super wealthy lil sibling to her actor sisters' Bruce Waynes. If you know, or are, this woman, please email us immediately at tips@jezebel.com, because we would really love to know the story behind this clip, and to shout you out for keeping your TV freakout hella low-key. UPDATE: Gawker reports that the sidepiece is allegedly a mainpiece.